Since Amiibo collectors are starting to get multiple Amiibos of the same character, I wanted to write a series of articles to settle the question: If I can only afford or only want to buy one Amiibo of a character, which do I choose? This “battle” style of article is in keeping with the spirit of the Smash Brothers and is hopefully both fun to read and a different way of reviewing some of the Amiibo line. So without further ado, let’s take a look at a battle between the most rotten members of the Mushroom Kingdom. 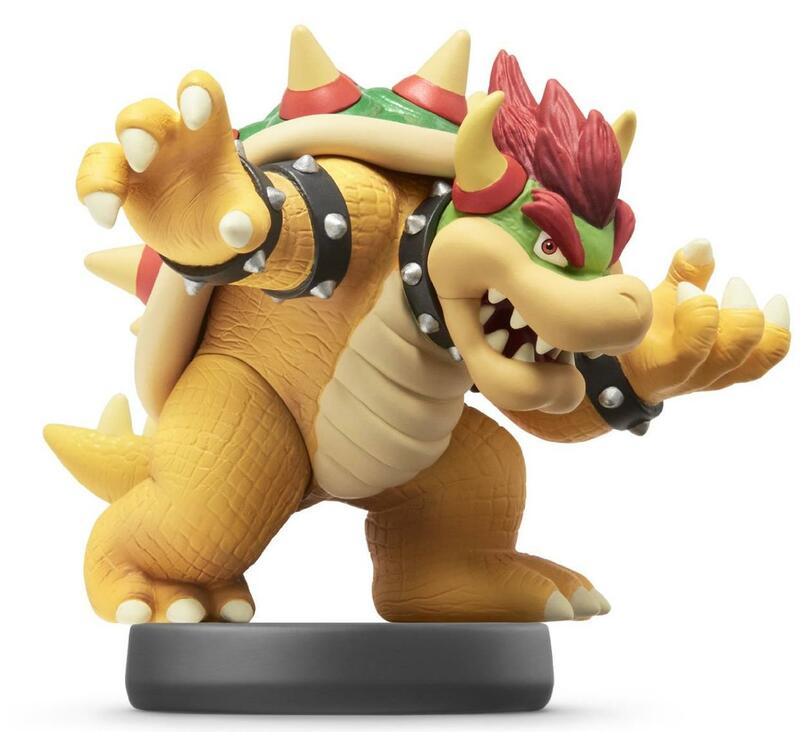 The Fighters – Bowser currently has two different Amiibos: the Super Smash Bros. (SSB) Amiibo and the Super Mario (SM) Amiibo Both Amiibos have been out for several months but are common and very easy to find on store shelves which makes it that much harder to choose which Bowser to buy. Colors – The SSB Bowser was released first and has a paint scheme to match his design in Super Smash Bros. The look is quite a bit different than how Bowser is usually depicted and his colors tend to be duller and more earthy. A good example of this is the spikes and the rim of his shell which are a darker bone color. His hair and eyebrows have a darker brick red than Bowser usually has, but is completely in line with Smash artwork. The one area that doesn’t look quite right is his green shell and forehead which are brighter than the artwork on the box. SSB Bowser looks a little more evil and menacing with the colors and is different than Bowser’s traditional appearance which is both good, because it keeps him from being too repetitive, but bad because it almost makes you want Bowser as you’re used to seeing him, especially since you’re only buying one. Most people would prefer Bowser in his traditional color scheme and I have to agree. The Super Mario Bowser has bright yellow skin and white around his shell and for his horns. This really makes him pop and it also makes the spiked bracelets stand out more. I also really like the red in his hair and eyebrows which really stand out. When it comes to color, SM Bowser is the winner. Texture – There is also a noticeable difference in the texture of the two Amiibo. 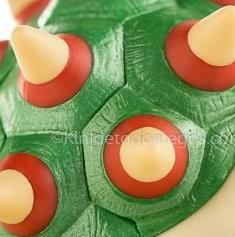 The SSB Bowser has some great details including the grooves on his chest and the plated appearance of his skin. The “plates” really make him look reptilian. There is nice texture in hair which makes it look messy and unkept. His shell has some detail to show lines and bumpiness that turtle shells have, but it is a bit uneven. A more consistent pattern would have looked nicer. The biggest advantage SSB Bowser has is that his mold lines around the mouth tend to be less noticeable than the SM Bowser. SM Bowser has more of a bumpy texture for his skin instead of the plates, but also has deeper grooves for his nose and snout. The grooves look really nice and just look more detailed than SSB Bowser. The best details on SM Bowser is his hair which has really nice fine lines through it which makes the hair look detailed and textured. His shell also has a really nice pattern to it that looks like a real turtle shell. The SM Amiibo came later than SSB and the advancements in Amiibo design do show through. This is a close competition, but SM Bowser wins this battle yet again. Pose – The biggest criticism of the two Bowser Amiibos is that the poses are so similar. 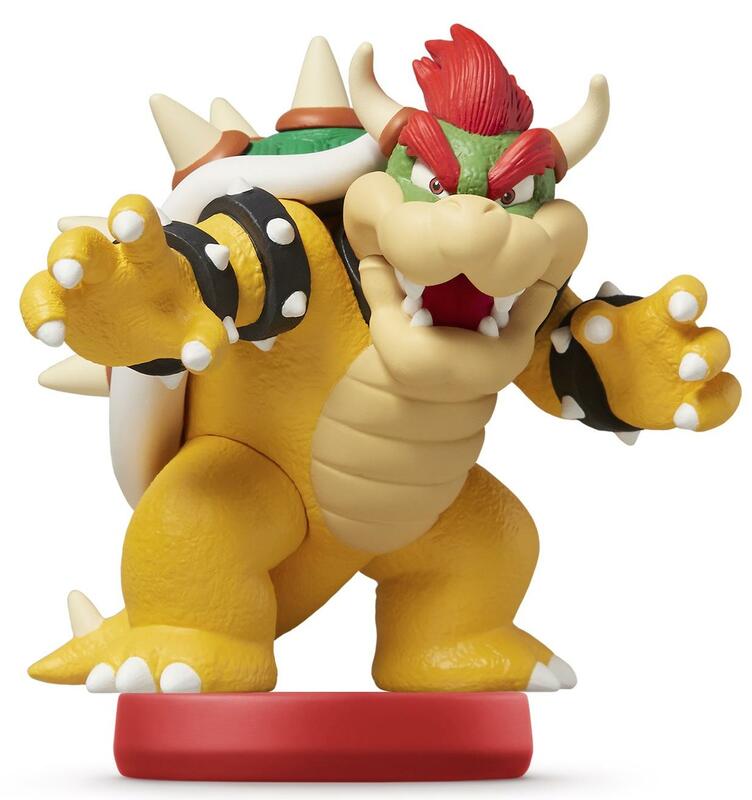 Bowser is big and not very mobile so it makes sense, but it is still the most disappointing aspect of these Amiibos. The SSB pose looks like he is either taunting his opponent or nearly ready to strike which fits the game well. SSB Bowser is hunching just a little as he gets ready to strike which is an interesting touch consider Bowser usually is as tall and imposing as possible in Mario games. The SM Bowser looks like he is ready to do battle with Mario. He has both hands open and is ready to swipe either the Princess or at Mario. This is a familiar, if not iconic pose for Bowser and I prefer it to the SSB Bowser. What makes the SM Bowser even better is that by him standing straight up, he looks even taller and more imposing which is perfect for his character. The Verdict – In this battle of evil, Super Mario Bowser wins easily. Not only is it more detailed, but it captures the Bowser that Nintendo fans love and fear at the end of so many Mario games. While there are great reasons for picking up SSB Bowser like completing a complete Smash set, if you have to pick one, the SM Bowser is the option I recommend. What do you think of the two Amiibo and which do you like best?